The planned new sitcom starring Michael J. 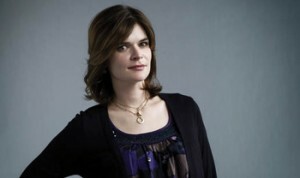 Fox on NBC has taken another step forward, as Betsy Brandt (Breaking Bad) is confirmed as being signed up to co-star as the lead character’s wife in the project. The sitcom sees Canadian-born actor Fox (Back to the Future, Family Ties) play a fictionalised version of himself in the form of ‘Mike Burnaby’ – a newscaster who suffers from Parkinson’s disease (the same disorder that Fox himself has suffered from for the past 22 years) who returns to work after taking several years of hiatus. Brandt best known for playing ‘Marie Schrader’ on AMC series Breaking Bad – is to portray Mike’s wife ‘Annie Burnaby’ in the currently-unnamed comedy, with her character described as one who works at the school of her daughter Eve, and is a ‘tough and loyal partner with a fun streak’. Other cast members recently confirmed include Kate Finneran (I Hate My Teenage Daughter) as Mike’s currently un-named sister, and Conor Romero as the lead character’s ‘drop-out son’. The show is set for a 22-episode first season likely to air in the next fall line-up for NBC, while filming is due to start in New York later this month. It marks Fox’s first regular acting position since starring on 1996-2001 sitcom Spin City, and a first recurring TV role since featuring in seasons 2 & 3 of The Good Wife on CBS. He has also performed some work for his most famous role during the current decade, becoming Marty McFly again for a remake of the original Back to the Future teaser trailer in 2010 to celebrate the film’s 25th anniversary (which can be seen below), and lending his voice to a number of various minor McFly characters in the conclusion to Telltale Games’ Back to the Future: The Game in 2011, amongst other acting positions performed over the last 3 years. He recently noted that he has been looking forward to getting back into regular acting, joking in a recent interview on the David Letterman Show (which can also be seen below) that: “I wasn’t doing a lot of work… I just thought, ‘As long as I play a guy with Parkinson’s, I can do anything’.”. With Michael J. Fox’s return getting ever-closer, will the role become another pioneering milestone in his contributions to raising awareness of Parkinson’s disease?